We would like to let our readers know that new material will be released on Thursday, January 31st. Stay tuned. "And That's The Boxing Truth." Undefeated two-division world champion Demetrius Andrade scored a twelfth round stoppage of WBO number eight Middleweight contender Artur Akavov to retain his WBO World Middleweight championship on Friday night in the Hulu Theater at Madison Square Garden in New York City, NY. In what was a tactical fight early on, Andrade’s hand speed and combination punching gradually took over the fight. Despite being tactically outgunned, Akavov was quite “Game” and never stopped trying to turn the momentum in his favor. In the twelfth and final round, a body shot followed by a left hand that did not land appeared to briefly stagger Akavov and Referee Arthur Mercante, Jr. stepped in and stopped the fight. Akavov, who had taken some punishment throughout the fight, protested the stoppage, but it was to no avail as Mercante told the native of Novocherkassk, Russia that he was concerned for his welfare and said there will be another day. Official time of the stoppage was 2:36 of round twelve. 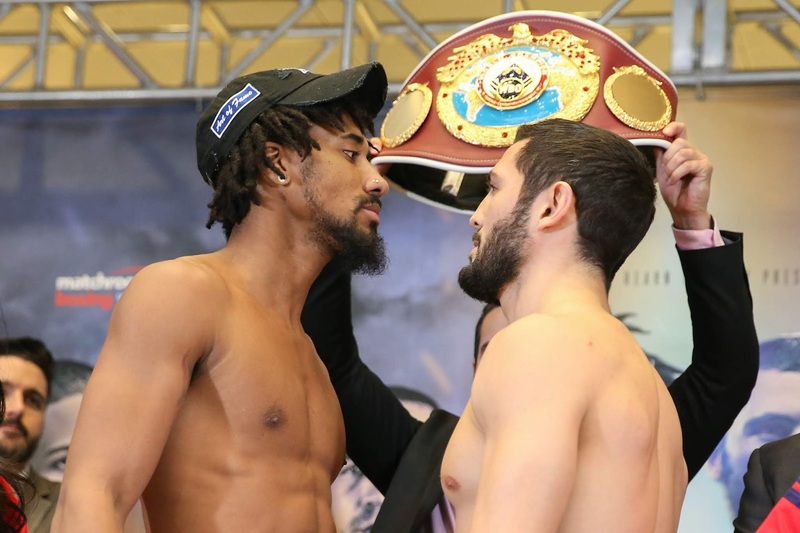 Demetrius Andrade advances to 27-0, with 17 Knockouts. Artur Akavov falls to 19-3, with 8 Knockouts. In a shocking upset, longtime Jr. Welterweight and Welterweight contender Pablo Cesar Cano scored an impressive first round stoppage of former three-division world champion Jorge Linares. Cano’s naturally bigger size and punching power were the story of this fight as he scored three knockdowns of the future Hall of Famer Linares before the fight was stopped by Referee Rocky Gonzalez. Official time of the stoppage was 2:48 of round one. Pablo Cesar Cano advances to 32-7-1, with 22 Knockouts. Jorge Linares falls to 45-5, with 28 Knockouts. In a battle for the vacant WBO Women’s Jr. Bantamweight world championship, multi-division world champion Amanda Serrano became a seven-division world champion as she scored a first round knockout over IBF Jr. Bantamweight world champion Eva Voraberger. A left hook to Voraberger’s liver ended the fight almost as quickly as it began as Voraberger went down and could not beat the count of Referee Sparkle Lee. Official time of the stoppage was :35 of round one. Amanda Serrano advances to 36-1-1, with 26 Knockouts. Eva Voraberger falls to 24-6, with 11 Knockouts. In the Jr. Welterweight division, former WBO Jr. Welterweight world champion Chris Algieri scored a lopsided ten round unanimous decision over veteran Danial Gonzalez. Algieri put on an impressive display of Boxing in the first seven rounds of the fight using lateral movement and effective body punching to out box Gonzalez. Algieri suffered a cut in round seven under his left eye as a result of an accidental clash of heads. Gonzalez, who has served as a sparring partner for Algieri in the past came on aggressively late in the fight, but was unable to turn the ebb and flow in his favor, despite the former world champion backing up throughout the latter stages of the fight. The result of a unanimous decision in favor of Algieri after ten rounds was not well received by the crowd in attendance as they booed the decision. Official scores were 98-92, 97-93, and 96-94 all in favor of Algieri. Unofficially, I scored this fight 97-93 in Algieri’s favor. Chris Algieri advances to 23-3, with 8 Knockouts. Daniel Gonzalez falls to 17-2-1, with 7 Knockouts. In a bout for the IBF Jr. Featherweight world championship, undefeated champion TJ Doheny successfully made the first defense of his world title by scoring an eleventh round stoppage of IBF number ten rated contender Ryohei Takashi. Both fighters suffered cuts in round two as a result of an accidental clash of heads, but despite the cut, Doheny was in control of the fight throughout and scored a knockdown of the challenger in round three. 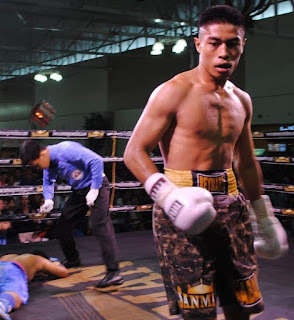 The end came in the eleventh round when Referee Michael Ortega stopped the fight at a moment that appeared odd in that although Takahashi had sustained punishment throughout much of the fight, he wasn’t in trouble when the fight was stopped. Official time of the stoppage was 2:18 of round eleven. TJ Doheny advances to 21-0, with 15 Knockouts. Ryohei Takahashi falls to 16-4-1, with 6 Knockouts. Undefeated Welterweight Reshat Mati scored the third win of his young career by scoring a first round knockout over Benjamin Borteye. Mati scored a knockdown of Borteye early in the round and was able to get a stoppage of Borteye from Referee Miguel Rosario at 1:06 of round one. Reshat Mati advances to 3-0, with 2 Knockouts. Benjamin Borteye falls to 4-4, with 4 Knockouts. The first defense of his WBO Middleweight world championship could likely set up some interesting possibilities for him in 2019 and beyond in the talent deep 160lb. Middleweight division. Among his possible options would obviously be to face the winner of the upcoming Middleweight unification bout between WBC/WBA/IBO world champion Saul Alvarez and recently crowned IBF world champion Daniel Jacobs, which will take place on May 4th. 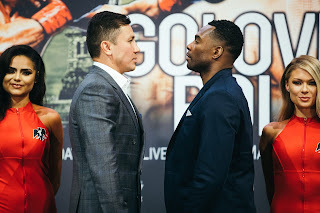 Another possible option would be for Andrade to defend his crown against former longtime Middleweight world champion Gennady Golovkin, who as of this writing remains a fighter without a broadcaster to televise his fights, with DAZN, ESPN, and the Premier Boxing Champions brand, which includes both Showtime and Fox as potential future homes for the former world champion. If Golovkin were to sign with DAZN, the possibility of full unification of the Middleweight championship of the world is very real as all the current world champions will be fighting on one platform and a fighter who in the opinion of many is still a world champion in Gennady Golovkin would also be a player in that mix. In closing one brief observation. A topic of some in the days ahead might concern the stoppages of both the Doheny-Takahashi and Andrade-Akavov fights. 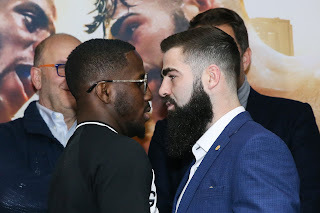 Although some might view the stoppages of these two fights as premature and may even call them controversial, it is important to remember that the knockout of Adonis Stevenson in December of last year at the hands of Oleksandr Gvozdyk, a brutal knockout that resulted in Stevenson being hospitalized after suffering traumatic brain injury is still fresh in the minds and hearts of everyone in the sport. As yours truly has stated since that fight both in my work here at The Boxing Truth® as well as on social media that under circumstances like what happened in the Stevenson-Gvozdyk fight, referees and athletic commissions may be a little extra cautious in trying to determine when a fight should be stopped following a situation like Stevenson’s. While Takahashi and Akavov were not in a situation similar to Stevenson, both did sustain punishment throughout their respective bouts and it is understandable that the referees of those bouts Arthur Mercante, Jr. and Michael Ortega were thinking of the long-term welfare of both fighters. Sometimes it is better for a fighter to come back to fight another day rather than taking one punch too many. 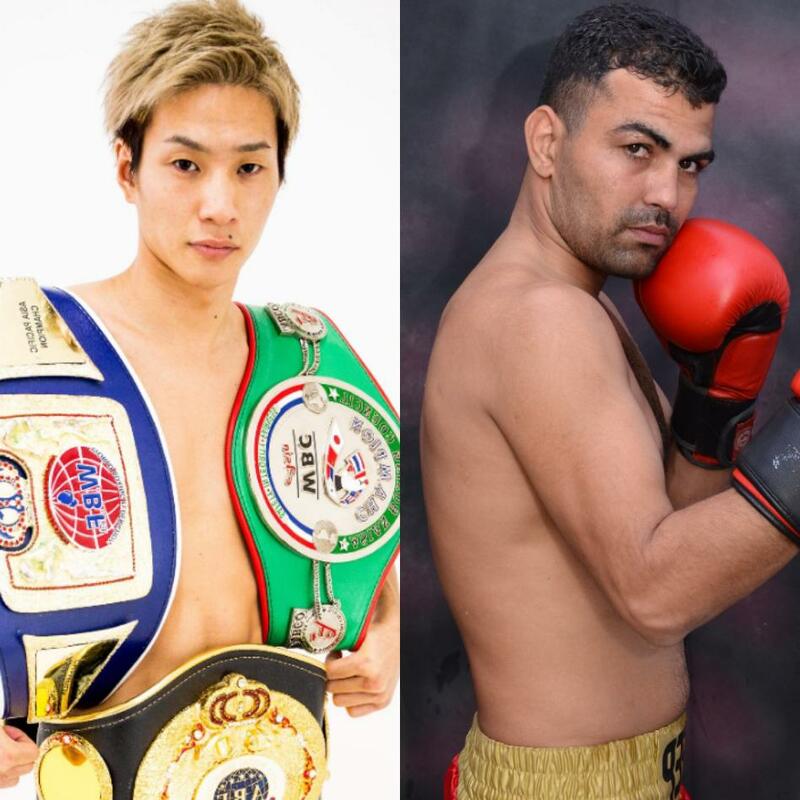 Press Release: January 17, 2019 by Sanman Promotions – Sanman’s first promotion for 2019 will feature its top two prospects fighting against marquee opponents on February 9 at the Midas Hotel and Casino. The event is also presented by ESPN 5. “This will be an exciting night of boxing. Filipino boxing fans will be treated to seeing our top boxers fighting at home. We assure of an even more exciting undercard to be announced soon”, Sanman CEO JC Manangquil stated. Undefeated Lightweight contender Devin Hamey scored a dominant ten round unanimous decision over previously undefeated prospect Xolisani Ndongeni in the main event of Showtime Sports' first ShoBox card of 2019 on Friday night at Stageworks in Shreveport, LA. Haney scored a knockdown of Ndongeni in the second round with a right hand and appeared to be on the verge of stopping Ndongeni several times throughout the fight, but was unable to get the stoppage. Despite being hurt throughout the fight and being outgunned, the native of South Africa Ndongeni was quite “Game” and was aggressive throughout. At the conclusion of the bout Haney had earned a convincing unanimous decision. Official scores were 100-88 (On two scorecards) and 99-90 all in favor of Haney. Devin Haney advances to 21-0, with 13 Knockouts. Xolisani Ndongeni falls to 25-1, with 13 Knockouts. In the Featherweight division undefeated prospect Ruben Villa scored an eight round unanimous decision over previously undefeated Ruben Cervera. Official scores were 80-72 (On all three official scorecards.) in favor of Villa. Ruben Villa advances to 15-0, with 5 Knockouts. Ruben Cervera falls to 10-1, with 9 Knockouts. In the Heavyweight division, undefeated prospect Frank Sanchez scored a second round knockout over Willie Jake. After an uneventful first round, the second round was delayed for several minutes due to two of the ring ropes breaking and needing repair. After the long delay, Sanchez was able to floor Jake with a barrage of punches that did not seem to land cleanly, but a left hook might have gotten through which sent Jake down to the canvas. Official time of the stoppage was 2:59 of round two. Frank Sanchez advances to 11-0, with 9 Knockouts. Willie Jake falls to 8-2-1, with 2 Knockouts. Showtime’s ShoBox series has a long history of showcasing developing prospects that have often gone on to become world champions in the series eighteen year history. For the twenty year old native of San Francisco, CA Devin Haney, he could well be on the verge of adding his name to the long list of fighters who were showcased on the ShoBox series to go on to become a world champion. How soon Haney might challenge for a world championship remains to be seen, but with current rankings in the top ten in the World Boxing Association (WBA) and International Boxing Federation (IBF) in the 135lb. Lightweight division, an opportunity to fight for a world title might come sooner rather than later. If Haney continues to win and more specifically continues to win in impressive fashion, it would not surprise this observer to see him get that opportunity before the end of 2019. The time has come once again for what has evolved over the years to be called “A Boxing Wishlist” where yours truly discusses what he would like to see occur in the sport during the new year. For those who read my column looking back at some of the highlights of what took place in Boxing in 2018, you may have noticed that I focused primarily on events that occurred in “The Business Of Boxing” and did not talk much about the events that took place inside the ring. This was due to the changes that occurred in the business realm that did not overshadow events that took place in the Boxing ring, but certainly changed the landscape of what may occur in both rings across the globe as the year 2019 begins and far beyond. It would frankly be impossible for me not to continue the theme of 2018 being a year of change and transition in the sport in this column as it will play a role in what might take place in the new year. There will however, be topics touched upon in this column that were not discussed previously. Longtime readers are likely familiar with previous editions of this observer's “Boxing Wishlist' where I typically touch upon a variety of issues. This year however, the theme could very well be thought of as how Boxing as a whole can continue the momentum that was built in 2018. While it is not the intention of yours truly to do a complete rehashing of some of the topics I discussed in last year’s “Boxing Wishlist”, some of what I touched upon at the beginning of 2018 are likely to play a significant role in 2019 and beyond. It cannot and should not be ignored the significant increase of exposure that Women’s Boxing was given on television and streaming platforms over the previous year. An increase of both exposure and recognition that I have screamed for, for years that was frankly long overdue. World champions such as Claressa Shields, Christina Hammer, Katie Taylor, and Cecilia Braekhus were all showcased throughout the year in marquee spots across various American television networks through both traditional and streaming models. Women's Boxing as a whole is perhaps the strongest it has ever been in terms of both television exposure and the depth of talent across the entire sport as 2019 begins. A wish of this observer for Women's Boxing is to obviously see the sport continue to grow and continue to be featured prominently across American television throughout the new year and beyond. While it is logical to think that the four world champions Shields, Brawkhus, Hammer, and Taylor might all be pitted against each other at some point, what I would like to see especially given the increased exposure the sport has received on the amateur level as well is an effort made by the various promoters and networks to attempt to develop fighters who are preparing to embark on professional careers. Boxing as a whole is a sport that is always in need of and openly seeks new stars. As we have seen in Women's Mixed Martial Arts (MMA) the sport is exposed to new fans when an effort is made to develop, promote, and provide fighters the necessary platforms to showcase their skills. Much as has been the case for Women's Boxing, there was also a period of time where the top MMA promotions resisted the concept of showcasing the women combatants in the sport. Over time however, that stance changed and Women's MMA bouts have been featured regularly on MMA events and in the case of the Ultimate Fighting Championship (UFC) have headlined several pay-per-view events. While the subject of "Pay-Per-View" is one that has been discussed frequently in various columns penned by yours truly both here on The Boxing Truth® as well as various online and print outlets through the years and will continue to be so, I see no reason why promoters and networks whether traditional or digital streaming cannot do the same thing for Women's Boxing especially given the ongoing transition of how the sport is broadcast and consumed. This subject of transition and the subject of "Pay-Per-View" will be discussed further later in this year's edition of this observer's "Boxing Wishlist." Another consistent addition of my "Boxing Wishlist" through the years has been my desire to see one "Undisputed world champion" per weight class. As I have said through the years, the very concept is no pun intended "Wishful Thinking" and given the fact that Boxing has seventeen weight classes as well as the various political elements that exist in the sport, it can be thought of as an impossible task. While it is indeed unrealistic for one to expect something such as this to happen in a relatively short period of time, I believe gradual progress can be made. The one obvious example that can be used in regard to this subject is in the Heavyweight division. One of if not the biggest fight that can be made in the sport that has not occurred before is a bout between undefeated Heavyweight world champions Deontay Wilder and Anthony Joshua, the two fighters who currently hold every portion of the World Heavyweight championship between them. Obviously, as each world champion has continued to retain their respective portions of the Heavyweight world championship, anticipation for an encounter to determine an “Undisputed Heavyweight world champion” has only increased. As obvious as an encounter between Wilder and Joshua being a fight that most if not all Boxing fans want to see, there was a wrinkle in the potential unification bout being made that could well put the idea of Wilder-Joshua on the back burner for most of 2019. The wrinkle being Wilder’s recent close call in his title defense against undefeated former Heavyweight world champion Tyson Fury in December of last year. A fight where Wilder trailing on two scorecards was able to retain his WBC world championship by scoring the second of two knockdowns of Fury in the twelfth and final round to earn a draw on what became a split decision. The decision of a split draw, seen as controversial by some, and Fury being able to provide the champion with a significant test has fueled demand for a rematch. Despite unified IBF/WBA/IBO/WBO world champion Anthony Joshua currently having an open date for his next title defense for April of this year and no opponent being announced as of this writing, conventional wisdom might suggest that a Wilder-Fury rematch might happen before a fight with Joshua. There are also other elements/aspects beyond one fight being made before the other that could also play a role in whether a fight to fully unify the Heavyweight division takes place as is virtually the case in any potential unification bout that could be made throughout the entire sport. As some readers might recall, another topic that has been a regular of the yearly “Boxing Wishlist” centers around the respective sanctioning organizations that regulate the sport. The topic of a dialogue that was established by the heads of the WBC, WBA, and IBF to discuss issues surrounding the sport with the hopeful goal of implementing improvements. When this dialogue was established a few years ago I applauded the initiative that appeared to be taken by the respective organizations. As I often say and will continue to say, if it is good for the sport, I will support it. One thing I said that I felt would be another step in the right direction that I touched upon in last year’s list was the inclusion of representatives of the WBO and IBO feeling that in addition to subjects regarding rules, regulations, and policies among other things that would come from such dialogue might be steps toward unifying each weight division in addition to the wish of this observer to see the designations of “Interim/Regular championship statuses revamped or outright done away with. Unfortunately, there was not much new that occurred regarding the dialogue in 2018, or at least that was made public. For the good of the sport, it is my hope that if the dialogue was discontinued over the last year that it can be re-established. Another element that resurfaced during 2018 was the reemergence of Bareknuckle Boxing with the debut of the Bareknuckle Fighting Championship, (BKFC) the World Bareknuckle Fighting Federation, (WBKFF) and Bareknuckle Fight Club (Bareknuckle FC) all emerging as professional associations devoted to Bareknuckle Boxing. As I have said in my coverage of BKFC and previous cards promoted under DirecTV’s BKB: Big-Knockout Boxing banner, these respective associations/leagues aimed at presenting Boxing in a different form than the traditional form of the sport opens opportunity for not just boxers, but also other combat sports athletes to potentially compete in a different fighting form beyond their primary combat discipline, not all that unlike the format of which Mixed Martial Arts (MMA) was initially presented upon it’s inception as an organized sport her in the United States in the early 1990’s. It also presents further opportunity for combat athletes to earn money. As I also said in previous coverage of Bareknuckle Boxing, a hurdle that all will have to deal with will be the issue regarding licensing and regulations in various states here in the United States and internationally. A battle that the sport of MMA fought for several years as the sport evolved from essentially no holds barred combat to its current form including the implementation of gloves, weight classes, rules, round limits, and adopting a ten-point must scoring system similar to Professional Boxing. All three of the Bareknuckle Boxing associations, the BKFC. Bareknuckle FC, and the WBKFF each established themselves staging cards in the state of Wyoming. The BKFC however, has expanded out staging its third event in 2018 in Mississippi and will expand to holding cards outside of the United States when they stage their fourth event in their history in Mexico in February. While it might appear that these Bareknuckle Boxing promotions might not face a similar struggle as MMA did regarding licensing and regulation, it is important to remember that unlike DirecTV’s BKB, which initially launched as a modernized form of gloved Bareknuckle Boxing using knuckle-exposed gloves, but quickly evolved to a more adapted format implementing standard Boxing gloves, the three Bareknuckle promotions use no gloves and frankly present Boxing in as close to its original form as possible. As Boxing fans were reminded recently with former Light-Heavyweight world champion Adonis Stevenson suffering a brutal knockout loss in losing his world championship and subsequently being hospitalized after suffering what has been described as traumatic brain injury, Boxing even with all the precautions that are taken both here in the United States and internationally that are intended to ensure the safety of fighters, remains a dangerous sport with no shortage of critics that call for Boxing to be banned. Although most calls for the banishment of Boxing come from critics who tend to voice their criticism and concerns the loudest whenever an unfortunate situation like the one regarding Adonis Stevenson occurs, circumstances such as this can present a further obstacle for groups such as the BKFC, Bareknuckle FC, and WBKFF as they attempt to gain licensing in more regions and states. While I won't classify this as a wish necessarily on this year's "Boxing Wishlist", seeing the potential of modernized Bareknuckle Boxing has to grow and provide further opportunity for combat sports athletes in the process, I do hope that the respective promoters do keep in mind the potential of circumstances like the situation regarding Adonis Stevenson's of occurring and take appropriate steps to ensure that fighters safety remains the top priority. While as I said earlier this week in looking back at 2018 that I felt the stoppage of the Stevenson fight was stopped at the appropriate time, accidents in not just combat sports, but all of sports unfortunately do happen. It is crucial that any sport take precautions and reevaluate regularly to ensure that safety remains the top priority. For the reemergence of Bareknuckle Boxing, it is even more important and without it, I frankly cannot see many state athletic commissions and international regulatory boards being willing to license Bareknuckle Boxing. Finally, we come to the final topic of this year's "Boxing Wishlist." A topic that has been an ongoing discussion of yours truly here at The Boxing Truth®, the ongoing transition in how the sport is televised to Over The Top (OTT) digital distribution/subscription-based streaming and what it means for the traditional Pay-Per-View model. While I discussed this subject earlier in the week in looking back at 2018 and do not intend to totally rehash what was discussed in that column or in previous columns, this subject will remain a central part of discussion not just here, but in the entire sport far beyond 2019. As most Boxing fans know DAZN and ESPN+ have emerged as major players in not just Boxing, but all of sports. With the recent exit of HBO, who left Boxing at the end of 2018, the landscape of how the sport is televised has changed significantly. On one side you have two digital steaming networks aiming toward the future of television distribution offering economically reasonable prices to consumers and offering considerably more content than what is offered on traditional television distribution. On the traditional television side, two networks have emerged to attempt to fill the void of HBO's absence in Showtime, the longtime rival of HBO, and Fox, who each recently signed multi-year agreements to carry cards promoted under the Premier Boxing Champions banner. The difference is each have their sights on broadcasting major fights on traditional Pay-Per-View. It is and should be no secret to longtime readers that this observer has strongly voiced his opinion that the traditional Pay-Per-View model has become overpriced and undervalued as years have gone on. While some may expect me as someone who has been equally vocal in expressing support for both DAZN and ESPN+ to be brutal in criticizing Showtime, Fox, and the PBC brand for apparently continuing to rely on an increasingly outdated and declining model of cable/satellite Pay-Per-View, I will not be overly critical. I will however, as always be "Brutally Honest." In some ways, I would consider the landscape of how the sport will be broadcast in the years to come is similar to the landscape that faced the cable/satellite television industry in its growing years where there was a sizable portion of consumers that preferred the free Over The Air (OTA) television model as opposed to paying a subscription fee to a cable/satellite provider for their television service. The slight difference is now more and more consumers are choosing to either cancel their cable/satellite television service or those who have never subscribed to cable/satellite television show little or no interest in subscribing. This is due to the advent of Over The Top (OTT) digital distribution or to put it more simply a distribution model where both television and radio content is delivered over the internet that does not necessarily require a cable/satellite television provider to act as a middleman to distribute said content to the consumer. As technology more and more is moving in this direction, there remains a portion of businesses that have thrived in traditional mediums of television distribution (The cable/satellite industry) that are reluctant to adapt to the changing times. For Boxing, there is a reluctance on the part of some promoters and networks to come up with a reasonably priced option for what was once thought as the holy grail, “Pay-Per-View.” While there are still some pay-per-view Boxing cards and even MMA cards that manage to produce solid numbers in terms of buys, there remains an overall decline in pay-per-view numbers over the years with those rare exceptions. As I have said in numerous columns regarding this subject over the years, I do not feel this is due to a general lack of interest in the respective sports, but rather a case where the pricing structure has turned a lot of consumers who would pay a pay-per-view fee off by most pay-per-view Boxing and MMA events being priced at $70 and above here in the United States. Quite frankly, I have felt and still feel that this has been a detriment to Boxing. While the PBC brand, Showtime, and Fox have produced solid Boxing cards and content over the years, I feel in order for them to be successful in the long term if they are going to insist on saving their major Boxing cards for pay-per-view that the price point will need to be lowered in order to make it more appealing. The challenge for them will be to not only produce content that will keep them competitive with both DAZN and ESPN+ by putting on the best fights possible, but also to have a competitive price point for their marquee (Pay-Per-View) attractions. It is important to remember that one end of the spectrum (DAZN/ESPN+) are appealing to consumers by offering considerable amount of content for a low-cost subscription fee where all the content is included with one’s subscription. On the other end of the spectrum however, you have two networks (Showtime/Fox) that while trying to remain competitive with OTT streaming networks are also going to be relying on the once tried and true model of cable/satellite pay-per-view for their marquee events. The question for the consumer will be whether they will be willing to pay an expensive pay-per-view fee on more than an occasional basis for marquee Boxing events promoted by the PBC brand on a per event basis. In preparation for this column while on this observer’s end of year vacation during the final weeks of 2018, I did some comparisons of pay-per-view prices for marquee Boxing events here in the United States from the 1980’s up to present day and present circumstances factoring in both DAZN’s and ESPN+’s subscription models into the equation. I was able to find prices for two pay-per-view Boxing cards, which took place in November 1988 that were scheduled just days apart. The first of these cards took place on November 4th headlined by a bout for the vacant WBO Super-Middleweight world championship between Thomas Hearns and James Kinchen. The televised portion of the card, which included three full bouts out of a full card of seven fights at the Las Vegas Hilton in Las Vegas, NV was offered to consumers at a $19.95 price point. This was followed by a pay-per-view card on November 7th from Caesars Palace in Las Vegas headlined by the historic battle between WBC Light-Heavyweight world champion Donny Lalonde and Sugar Ray Leonard. A bout historic because not only was Lalonde’s Light-Heavyweight world championship on the line, but also the vacant WBC Super-Middleweight world championship making it the first and only bout in Boxing history where world championships in two separate weight classes were at stake in one fight. Similarly to the Hearns-Kinchen card, the televised portion of the Lalonde-Leonard card featured a total of three bouts out of a card of six fights was offered to consumers at a $29.95 price point. Keeping in mind that at the time of this column we are discussing pay-per-view cards and prices from nearly thirty-one years ago, if one were able to have access to both events back then, they would have paid a total price of nearly $50. When one factors into the equation that in the 2000’s and 2010’s pay-per-view events for Boxing and MMA have been priced at or around the $70 range as a standard price point, even with greater technology and availability today as compared to the late 1980’s, if one were to purchase two cards scheduled days apart from each other at current prices they would likely pay a total price of $140 for cards offering the same amount of content as those that were offered to the public on both a pay-per-view and closed-circuit television basis decades ago. While some might argue that this is due to inflation and other factors, it doesn’t take much to figure out why pay-per-view buys have generally declined as prices for these cards have only increased over time, with the rare exception where a marquee event, which can at times be priced between the $80-$100 range still does solid buys. Although the realm of traditional cable/satellite pay-per-view will remain part of the sport for the foreseeable future, as someone who is objective viewing things from the outside as a journalist covering Boxing, I cannot see the traditional pay-per-view model being able to last at the current price points. This is due largely to both the growth of cord-cutting as well as the overall value and content offered by digital streaming network platforms like DAZN and ESPN+ who each offer a low-monthly subscription price at $9.99 (DAZN) and $4.99 (ESPN+) with ESPN+ also offering a yearly subscription option priced at $49.99. The challenge for all those involved in the sport however, will continue to be offering content that consumers will be willing to buy and for Boxing that means making bouts that consumers want to see on a consistent basis and within a reasonable time frame. Given the amounts of money that all these networks have invested in the sport with the want of exclusivity for their respective platforms with various promoters that are not always willing to work together, it is also important for all of the above to be willing to negotiate with each other in order for those fights to be made. What is also important is for the various networks involved to attempt to develop new stars in the sport by offering up and coming fighters a platform to showcase their talents. The latter, especially with regard to Women’s Boxing, had largely been ignored by several networks through the years and one might argue that it led to the changes we are now seeing with networks that were previously in dominant positions within the sport no longer involved. The final wish of this observer’s “Boxing Wishlist for 2019” is for the networks involved keep the ultimate authority in mind as they look to continue building their respective brands by attempting to offer events that consumers will want to see, the Boxing fan. While there will also continue to be a segment of fans that no matter what a network/platform offers will continue to complain and voice their dissatisfaction with the sport, without the support of the Boxing fan all of the above will not be able to survive. Although yours truly remains firm in his stance in wanting to see the model of pay-per-view either significantly revamped or done away with in the interest of both the consumer and in wanting to see Boxing grow, we will see how things look in 2019. As the 2019 Boxing schedule is set to begin, we will also see if the sport will continue to be in a position of building momentum by year’s end. This observer certainly hopes Boxing will be.